gain 70 hp & save fuel! The Powershot propane dual fuel conversion kit received US Patent #6422015 in 2001 for proprietary technology that no other company has. Diesel Performance Products has sold the Powershot PDI (propane diesel injection) for more than 13 years in the U.S. and around the world. They have distributors who’ve worked hard to test the product through actual fleet and independent vehicle use. The results have verified improved mileage, cleaner running engines, less maintenance and excellent return on investment. 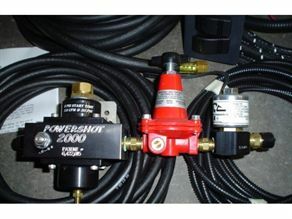 The Powershot system meters propane into the engine based on the turbo boost pressure of the engine. Long says the mechanical system is easy to install, doesn’t have any effect or impact on the vehicle’s functionality, doesn’t change any of the manufacturer’s components or set perimeters, and there aren’t any permanent modifications to the vehicle. The system doesn’t use a computer and installation doesn’t involve changing or interfering with the engine’s original fuel management/ delivery system. All of the kit components are UL listed and CSA approved. It’s installed next to the diesel tank and only two lines run into the engine compartment. The vapor fuel tank mounts on the frame of a semi-tractor or a straight truck. If the kit is used on a pickup, the tank is placed in the box. For safety purposes a control switch is mounted in the dash and must be re-activated each time the vehicle is started. 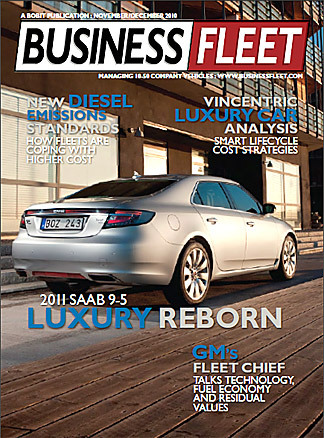 The product has become even more popular as the cost of diesel fuel continues to rise while LP remains very reasonable. Fleet owners and diesel operators are looking for a way to save money and the Powershot provides the ideal solution. Verified research results using the device in trucking operations have shown 20 to 25 percent increases in torque and horsepower and fuel savings of 10 to 25 percent. 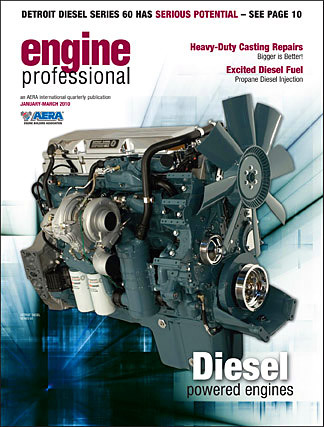 Fuel costs on a 580 Diesel were compared in April 2011 and 2012, showing savings of $4.10 per hour and $4.53 per hour when the propane kit was installed. Diesel fuel consumption was reduced by more than 50 percent. Duane Bellum Farms of Gillespie, Ill., has installed the Powershot system on three Deere tractors, including two MFWD models and a 4-WD. Bellum says they’ve been very pleased with additional power,cleaner operation and fuel savings of around 30 percent for each tractor. Stationary diesel engines used in irrigation are another prime market. 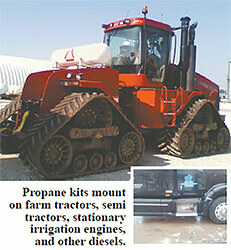 With a Powershot kit the combined fuel cost savings may be 30 percent less compared to running on straight diesel. The Powershot System has received IS0 Certification, has obtained European and Australian Certification and is also recognized by LP and CNG industry associations. 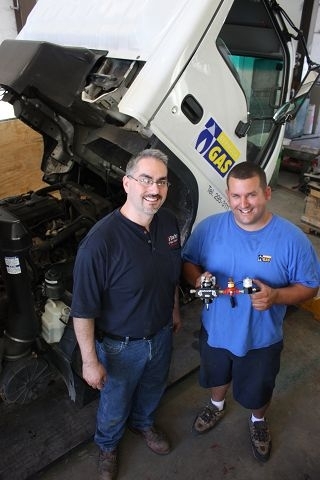 Fuel booster: Jeremy Stanford of Stanford LP Gas Inc and Perry DeSilva of Bermuda Gas with the propane injection system which will be used in all Bermuda Gas trucks. Bermuda Gas claims to be the first company on the Island to convert its fleet to propane-injection powered vehicles. The firm invited Jeremy Stanford and Gary Shepherd of Stanford LP Gas Inc of Michigan over last week to install and train its staff on the systems. The pair, who have been in the business for almost 20 years, have already fitted kits to 10 of the vehicles with the applicable turbo engines, including bulk models, taking half a day to put in each one. The technology provides cost savings on fuel and reduced emissions and pollution. Each system costs about $1,000 to $3,000, but the savings that can be made outweigh the initial layout, according to the experts. Other selling points are that they are regarded as safe and easy to use. Judith Uddin, vice-president of administration and operations at Bermuda Gas, first came across the concept through networking, hearing nothing but good things about the propane injection system which can be used in diesel and gas engines and after sharing some statistics decided to bring in Messrs Stanford and Shepherd to implement them. “That really piqued my interest, especially for use in Bermuda, where you are using a cleaner burning gas with reduced emissions and the added bonus of cost savings,” she said. “By using it I can get twice as much for my buck than just running off diesel alone. The system works by a small injection of propane to the diesel which makes it run more efficiently. The technology has been available for more than 50 years and has been rolled out across Europe and the US, as well as the Cayman Islands - another small island application which has proved to be a big success. Applications for the system range from trucks, buses and taxis in New York, Maine, Texas and California, to police cars in London, Ontario, Canada and at the Denver International Airport - as governments push for cleaner emissions and set new standards. It has even been used in lawnmowers. Ms. Uddin said that the new systems had been met with universal approval from the truck drivers, especially when climbing up steep hills. One driver remarked that running on just diesel he crawled up a hill in second gear, but with the propane injection he could take it in third. “The reports back from our truck drivers have been 100 percent positive,” she said. Mr. Shepherd said that while each fleet of vehicles was different in the way it was run, about 20 percent could be saved in operational costs, while the particulates that produce soot in the emissions could be cut by at least 70 percent and overall emissions reduced by around 30 percent. Mr. Stanford said that he was now trying to get the word out about the benefits of propane powered vehicles and reach a wider audience. “We are trying to advocate to as many people as possible that this is a viable technology for cost savings and emission reduction,” he said. Bermuda Gas plans to take the newly-installed vehicles to the Transport Control Department (TCD) in a couple of weeks for emissions testing and carry out further tests over the coming months and if it proves successful roll it out to its sister company Belco, Government and to others users. “Our ultimate goal is that every single one of our trucks will be powered by propane in the future as the older ones are phased out,” she said. The Powershot 2000 Diesel Propane Injection System can be retrofitted onto a bus’ engine without any modifications to the engine. When installed on a School District of Westfield bus, it helped to decrease exhaust emissions by 60 percent, according to Transportation Director Scott Peterson. A system by Diesel Performance Products that has been tested by pupil transportation operations in Arizona and Wisconsin can reportedly help increase school buses’ torque and horsepower while decreasing fuel consumption and emissions output. The Powershot 2000 Diesel Propane Injection System can be retrofitted onto a bus’ engine without any modifications to the engine. It injects propane in increasing amounts into the engine’s air intake system as the boost pressure level of the engine increases. Keith Long of Diesel Performance Products told SBF that in addition to improving a bus’ power, performance and drivability, the Powershot 2000 is a convenient alternative to running a bus solely on propane because if the bus runs out of propane, it can continue to operate on diesel. “Many districts cannot afford to purchase new or alternative-fueled buses without bond money or government incentives, so they are unable to ‘green’ their fleets and save on fuel costs. The Powershot can offer a return on investment usually in one school year depending on the cost of both fuels and the mileage increases achieved,” Long added, noting that the Powershot 2000 retails for between $1,500 and $2,000. A propane tank that will accommodate at least 25 percent of the bus’ fuel capacity is required for operating the Powershot 2000. 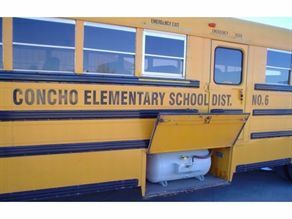 John Bedway, transportation director at Concho Elementary School District #6, said the system gave this bus more power. 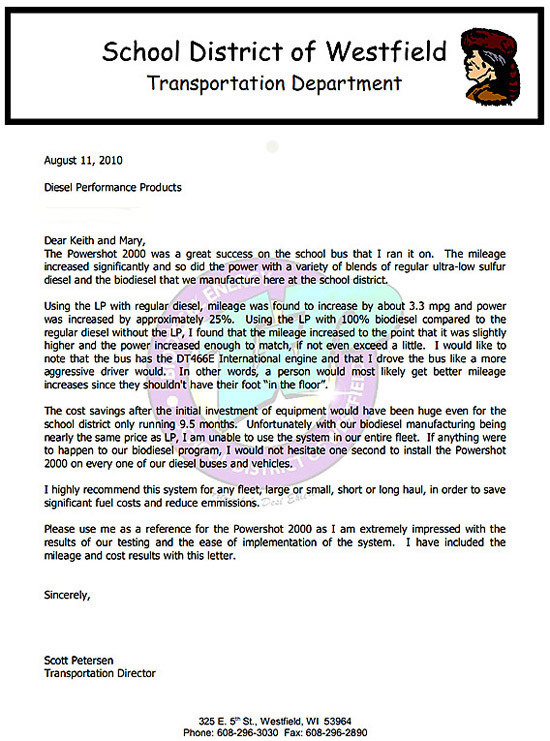 For John Bedway, transportation director at Concho (Ariz.) Elementary School District #6, the Powershot 2000 gave one of his 1997 Amtran school buses 10 to 15 percent more power. “The bus was really underpowered and almost unusable, but now it’s working great for routes and field trips,” Bedway told SBF in mid-October. In addition to the increase in power, Bedway said the bus is getting about 21 percent better fuel mileage. Prior to installing the Powershot 2000, the bus was getting 6.32 miles per gallon (mpg), and it is now getting 8.04 mpg. Moreover, he noted that using the system has yielded a cost-savings of $.042 per mile (diesel and propane included), so he is saving $840 every 20,000 miles. “It really cleaned the bus up — you don’t see any black smoke coming out of the bus,” Bedway added. After seeing the benefits of the Powershot 2000 on the older bus, the district purchased another system, which Bedway would like to install on one of his 2006 or 2007 model year buses. “I’m hoping that the propane will help me run the bus a little cleaner and give me more life out of it,” he said. The School District of Westfield in Wisconsin also tested the Powershot 2000 on one of its older buses. Transportation Director Scott Peterson told SBF that the system provided the bus with 25 to 30 percent more horsepower and helped to decrease exhaust emissions by 60 percent. He used the Powershot 2000 on the bus when it was fueled with a 50-50 blend of biodiesel and diesel, and when it was fueled by 100 percent biodiesel. “When we ran the Powershot with 100 percent biodiesel, the bus had just as much power, if not more than when it was fueled by regular diesel without the Powershot,” Peterson said. He also said that the bus’ mpg increased. “When we used the system while running the bus on diesel, it went from 7.36 to 9.83 mpg, which is very good for an older school bus,” Peterson said. He added that if he did not have buses powered by biodiesel, he would invest in a Powershot 2000 system for all of his buses because the cost-savings is so significant: He estimated that the system would have reduced fuel costs by $30,000 per school year. Click here to read the article (.pdf format) published in the Business Fleet Magazine about our Powershot 2000 propane injection system. SEBRING - The high cost of tipping fees at the Highlands County landfill and the possibility the fees could increase caused Sebring Public Works Director Rob Miller to look at money-saving options, including construction of a solid waste transfer station and installing propane injection on trucks. "I'm seeing an increase (in gas mileage) pretty substantial," said Miller. "The company that was putting these in on the trucks on a trial basis was expecting savings anywhere from a 15 to 20 percent increase; I've got one truck that actually showed over a 100 percent increase in mileage."
. "Is the propane a part of that, yes, I'm sure it is a part of it," he said. "But also a part of it is the driving habits of the operators; how many stops they're making, how long they're idling versus how long they're traveling, and things of that nature." It looks like we've got a way to save money on some gas and oil, he said. He wants to equip the remaining trucks to that system. They took the oldest, the worst and most beat up trucks they had. One test truck, Miller called "one of the oldest dogs in the fleet," was only getting a half a mile per gallon and the system got it up to two mpg, he said. The city is also considering putting in a propane fueling station at its solid waste office site. Read more testimonials about our Diesel Propane Injection Systems here.